Brittany Ferries will take you to either Cherbourg, Caen, Le Havre or St Malo. LD Lines goes to Le Havre but could be less expensive. Check the rates below. 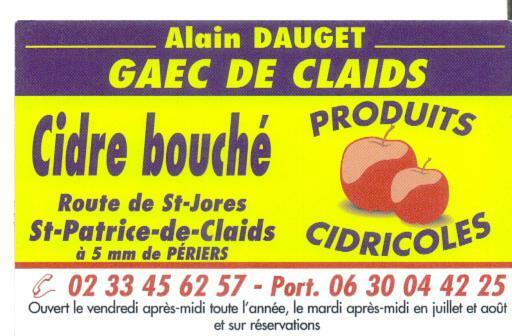 Alain Dauget is our local cidre producer. Please pay him a visit on a Friday afternoon and he will be only too pleased to give you a tour followed by a generous sampling of his wonderful cidre products. Cidre bouché is the famous drink produced from apples in the region of Normandie and is available as doux, demi-sec and sec. He makes a fantastic 44 liqueur made with orange, coffee and vanilla. Equally famous is his calvados 'eau de vie' which should be treated with enormous respect! Click the link above to locate La Forge.